Summary: “How can you be a Christian and a philosopher at the same time?” This question has haunted Vance Morgan ever since it was posed by a good friend almost thirty years ago. 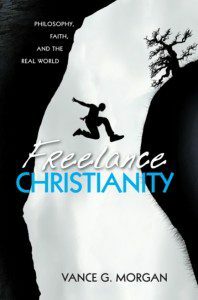 Freelance Christianity is rooted in Morgan’s conviction that, far from being fundamentally opposed, truly philosophical energies and a commitment to a vibrant, lived faith are complementary, mutually supporting, and marks of a healthy quest for the divine. This book brings together his training as a philosopher and experience as a person of faith in an investigation of how the life of faith can be lived with a rigorous commitment to the pursuit of knowledge in real time. If you’ve ever wondered how a person can be a Christian and also an intellectual, this is the book for you. In an engaging, personal style, Morgan brings his keen philosopher’s insight to work on our concepts of God and the nature of belief. In discussing how faith works in us he goes beyond the expected areas of attentiveness, silence, and humility, and explores courage (what do we fear? what is worth dying for?) and beauty as the place where the human and the divine meet. Rich with allusions to the Bible, popular culture, and both ancient and contemporary authors, this book is a refreshing reminder that faith is not something abstract but is revealed in transformed lives here and now. Vance Morgan is the college philosophy teacher everyone should wish for. In these sometimes outrageous and always imaginative essays (e.g., an exchange between Jesus and the Sadducees rendered as beer-fueled guy-banter in a sports bar), Morgan shows how we live in and through big ideas every day, and that faith and reason correct and fulfill one another, even if, as in any marriage, things get testy at times. Vance Morgan brings everything important to bear in these insightful, witty, and even moving commentaries on the questions of faith. He doesn’t stand above them, either. He is personally generous as he adds to the mix his own pilgrimage from being the son of a conservative Baptist pastor to being a philosopher and teacher. Walking together, we learn along the way that the questions of faith are questions of faith and life. Summary: This clearly written book introduces readers to Simone Weil’s philosophy of science and mathematics. Weil held that, for the ancient Greeks, the ultimate purpose of science and mathematics was the knowledge and love of the divine. Her creative assimilation of this vision led her to a conception of science and mathematics that connects the human person with not only the physical world but also the spiritual and aesthetic aspects of human existence. Vance Morgan sketches an outline of a metaphysical foundation for mathematics and science that, according to Weil, opens the door to a reinvigorated discussion among science, philosophy, art, and religion. 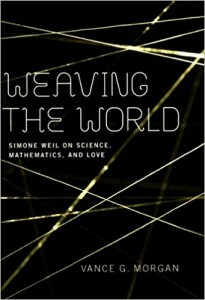 Weaving the World is a well-written and lucid overview of Simone Weil’s writings on science and mathematics. This book will be of great benefit for anyone who wishes to pursue Weil’s thought in depth. Weaving the World is a detailed account of the philosophy of science and knowledge of Simone Weil. It is a very useful contribution to our understanding of one of the deepest and most incandescent thinkers of the twentieth century.